As I was confined to barracks the other day the CEO suggested that a clean-up of the office would be in order, and as reams of paper were being removed to the out-basket a crumpled paper bag turned up – and it had to be important as it had Hunting & Fishing New Zealand stamped on it. Scribbled on the back was some words of wisdom I’d found in a magazine whilst in NZ and it had taken my fancy. Tell me and I forget, teach me and I remember, involve me and I learn! 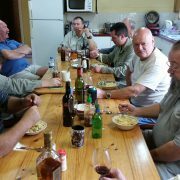 So as I pondered ………..
Last month’s Club Trip emphasised what a great fraternity exists among fly fishers. 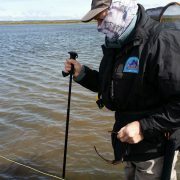 The waters around Ballarat were all very low and no fish were caught by any of the group. 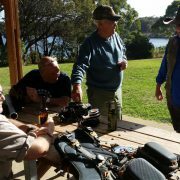 However, the venue gave some of us the opportunity to join the Ballarat Fly Fishers “happy hour” in their clubrooms on Lake Wendouree. A great venue and we were warmly welcomed for a few drinks and suggestions about where the fish might be. On the local front, Devilbend ……. Greetings Fellow Fly Flickers and a Happy New Year to you all. 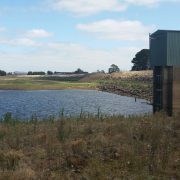 Well the Tassie trip has been and gone—and what a mixed bag! Gale force winds for most of the week, snow again and mixed fishing results due to the weather and low water in a number of he usual hot spots. The good results were for those who braved the cold at night and waited till the wind dropped to fish the low levels at the Great Lake. However, all was not ………. 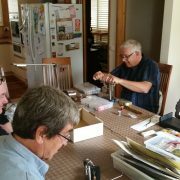 Well, our small band of fly fishers have been, seen and returned educated in the art of fly fishing NZ style. 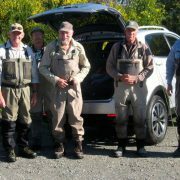 It was a pleasure to be guided and taught by our Tongariro fly fishing guru Frank Schlosser, and our Rangitikei Rafting & Fly guiding guru Steve, both ably assisted by our own local guru Peter Wilson. They freely passed on their local knowledge of their water, fly’s and rigs as the taught us how to cast in all conditions with leaders up to 6m long. Gee, don’t you hate it when you open your mouth and you say you will do something before you go away, and they remember it and you don’t! The outdoor setting which seems to be getting bigger by the hour is getting a makeover. i.e. Gerni, sand and oil— all before I can get on with the important task of packing for the NZ trip. Bugger!!! Just when I thought I had grown up — a short note from Mr Wilson arrived and a reminder that it was only forty-one sleeps until I was on a big bird and off to New Zealand to spend a week trying to catch a fish or two on the mighty Tongariro River. After talking to the rest ……. The One Fly is now over and some of us are looking forward to the upcoming New Zealand trip. We had a great roll-up of club members to Newlyn Reservoir at the weekend. Unfortunately the fish proved to be elusive despite the fact that members patrolled the entire lake in an attempt to take a fish. Well the Annual Dinner and AGM are over for the year so it’s a return to work for your committee. It is also time to say a big thanks to Sam—stepping down after 10 years of exceptional service on the committee. A warm welcome to Jon K—the new kid on the block. I have noted that ……..
Well its getting close to the business end of the year and time to turn your thoughts to the Annual Dinner. A time to treat the other half to a ‘slap-up’ feed that they don’t have to cook or clean up after. A time to say thank you for ……..